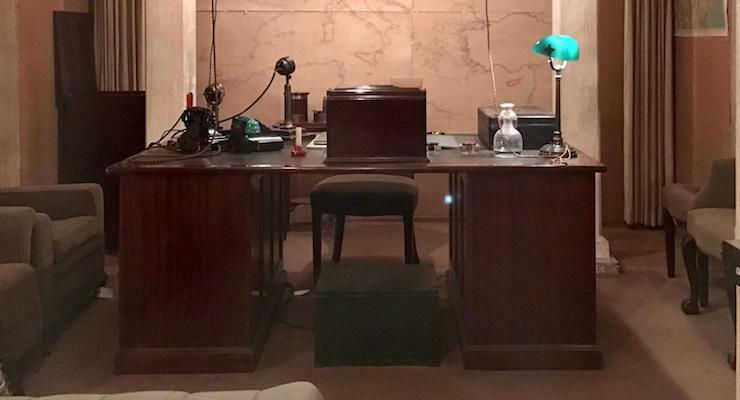 The Churchill War Rooms are a series of bunkers which lie beneath the streets of Westminster. 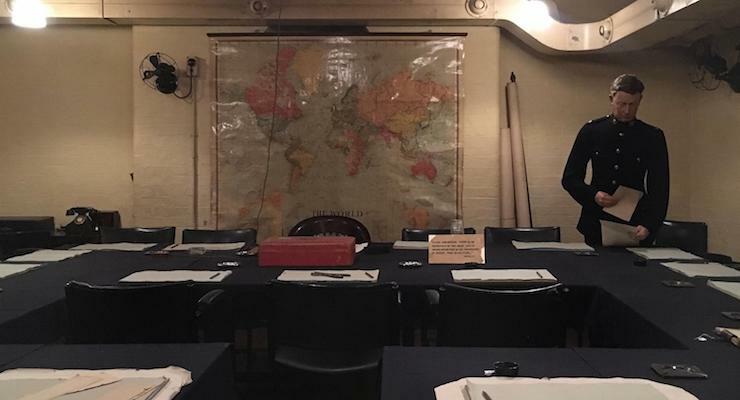 This was the secret London location where the then Prime Minister Winston Churchill and his war cabinet planned and directed Britain’s actions during the Second World War. These rooms are now part of the Imperial War Museum and are open to the public to visit. On the same site is the Churchill Museum. I went to the Churchill War Rooms and Museum with my daughter (19) and some friends the day after we’d been to Chartwell, Kent. Chartwell is the country house where Churchill lived with his wife and children. It now belongs to the National Trust, and its house (set up as it was when the Churchill family lived there), gardens and extensive grounds are fascinating to explore (read my post Exploring Chartwell, Churchill’s family home if you’d like to know more). It was interesting to visit Chartwell and the War Rooms on consecutive days, and to contrast life in London with life in the countryside during WWII, as well as learning about different aspects of Britain’s wartime leader. We walked to the Churchill War Rooms from Victoria train station, and it took us about 20 minutes to get there. When we arrived we found a queue of around 50 people waiting to go in. We hadn’t thought to book our tickets, but I’d definitely advise you to do that if you go. We queued for around half an hour to get into the building. A member of staff told us that this was a quiet day and that sometimes people queue for two or three hours to get in (I have to say that we wouldn’t have done that, we’d have gone somewhere else rather than wait that long). Apparently visitor numbers have increased since the release of the Oscar-winning Darkest Hour film (which I have yet to see). Once inside, our bags were searched, we bought our tickets and were each given an audio guide to lead us through the rooms. I found the information which the audio guide provided to be very interesting and helpful. We were led through narrow corridors to see a variety of rooms, all set up as they were during WWII. It felt as if Churchill, his cabinet and staff had just popped out and could be back at any moment. The Map Room was the military information centre where troop movements were tracked and recorded day and night. It remains as it was in 1945, when WWII ended. The compact Transatlantic Telephone Room was disguised from staff as Churchill’s private toilet and was where Churchill had secret conversations with the United States President during the war. The War Cabinet Room is where Churchill and his cabinet met to decide on strategy. There are also living quarters for Churchill and other key members of staff. Churchill’s bedroom is where he occasionally slept and also where he made some of his wartime speeches. At times during the Blitz, many of the War Room staff spent day and night there, sleeping on a level below the main rooms. This sleeping area isn’t open to the public, but we saw a ladder which leads down to it. 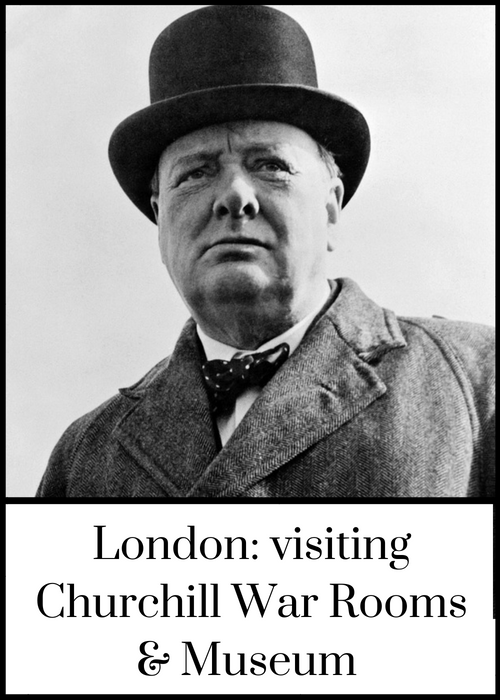 The tour includes access to the exhibition in the Churchill Museum, which is next to the War Rooms and looks at the statesman’s life, family, achievements and interests. I was astonished to learn that between 850 million and 900 million people around the world watched or listened to the broadcast of Churchill’s funeral in 1965. There are many interactive exhibits here, and you could easily spend a couple of hours in this room alone. I enjoyed visiting the Churchill War Rooms. It presents WWII history in a way which is accessible and easy to understand and it’s fascinating to see what life was like for the people who worked here. It’s interesting to learn about Churchill’s life both during WWII and when he wasn’t Prime Minister. I publish a monthly round-up of the top things to do in London with kids – you can find the latest version here.